Poussin's great work of 1643 depicts Banksie, a contemporary graffiti artist, defacing a small wall near Rome. Banksie is carefully carving a rat skull into the stone. Beneath this skull, he engraves his famous catchphrase, Et In Arcadia Ego, which can be roughly translated as "Exit Through The Gift Shop." Unfortunately, there weren't any gift shops in Rome in the seventeenth-century, so nobody coming across the graffito understood the irony implicit in Banksie's catchphrase, or even knew what it meant. This is why it would take another three hundred years for graffiti to become a popular art form, and even today most graffiti artists try to avoid using words whenever possible. Poussin, on the other hand, was a very popular artist of the period, receiving commissions to paint toga-clad ne'er-do-wells in gloomy rural surroundings from most of the crowned heads of Europe. 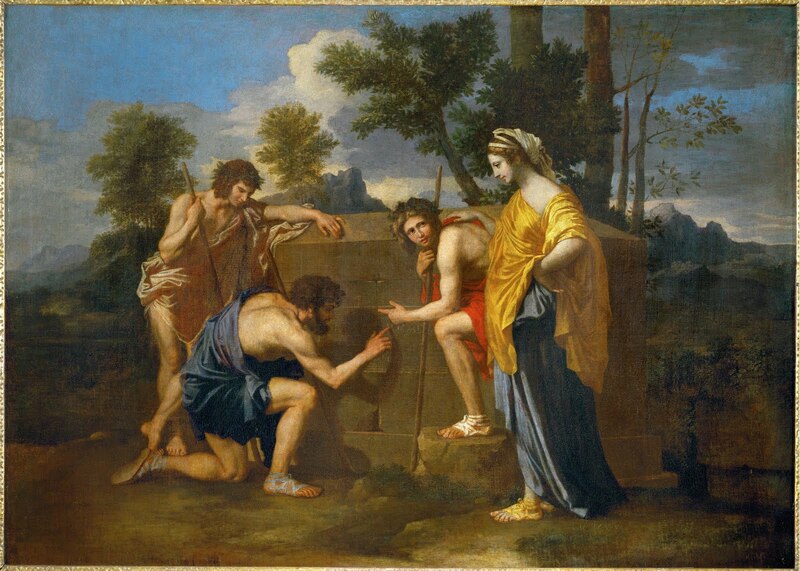 Poussin died a rich man. Alas, his work is now considered boring and old-fashioned, condemned to be hung in the least visited galleries in the museum. Banksie's work, however, is undergoing a great renaissance. The many walls he defaced have all been designated "heritage" sites by the Italian government. Many have even become famous Roman tourist attractions and, ironically, popular souvenirs of the city. Thus does the wheel of fortune spin in the art world.